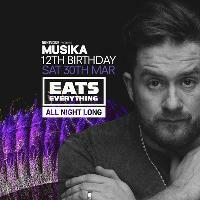 The one and only and long-time Edinburgh favourite Eats Everything is joining us in 2019 to celebrate 12 years of Musika. EATS will be treating us to a special rare ALL NIGHT LONG set. Grab your tickets sharply, this one will fly!